This media chest would look incredible in any contemporary room as the lines and details give it a modern look. At the same time, the pull handles give it a traditional twist which proves how versatile this chest can be. The six drawers are great for storing CD's and DVD's while the two open compartments are ideal for CD, DVD, and Blu-Ray players. The Carrington II Media Chest with 6 Drawers by Liberty Furniture at Novello Home Furnishings in the Berlin, Barre, Montpelier, VT area. Product availability may vary. Contact us for the most current availability on this product. This collection is the epitome of modern elegance and style. 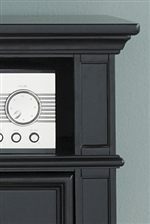 There are fantastic carvings and details on every item which pulls everything together and creates a sense of harmony. Many of the items look fantastic on their own or paired with a different black bedroom set but they also look incredible when placed together. 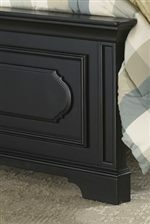 The black pine solids and painted wood products are topped off with a black finish that will surely match any color walls and bedding. 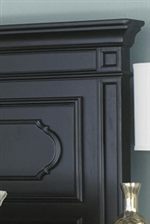 The Carrington II collection is a great option if you are looking for furniture in the Berlin, Barre, Montpelier, VT area. Browse other items in the Carrington II collection from Novello Home Furnishings in the Berlin, Barre, Montpelier, VT area.